I finally brought to life my Bronze Age Fig Beer, inspired by archaeological findings at Kissonerga-Skalia in Cyprus, in a small-batch brew day that had me flying by the seat of my pants from start to finish. For small batches, I use the “Brew In a Bag” (BIAB) technique described in the October 2012 issue of Brew Your Own magazine, and also online here. The mash is done directly in the kettle with the grist contained in a nylon mesh bag. BIAB is great for the all-grain brewer looking to save time on brew day, because there’s no sparge. Lautering is as easy as lifting a bag of wet grains (which can admittedly be heavy, if like me, the only workout you get regularly is the ol’ 16-ounce curl). 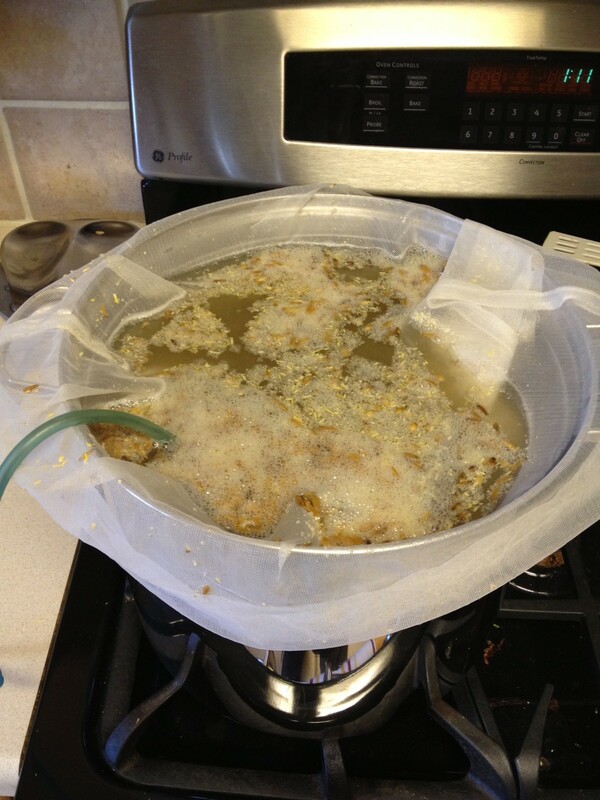 It’s also a great way for extract or partial mash brewers on a budget to explore all-grain brewing without expensive new equipment: just a brew kettle and the same mesh bag you may already be steeping grains in. Most BIAB brews call for all the brewing liquor up front. The result is a very thin mash – 4 qts/lb in my case – but once the saccharification is done, the bag comes out and the wort can be brought to a boil immediately without sparging. Efficiency suffers, but this can be compensated for with a little extra grain. BIAB works for any batch size, provided the kettle is big enough for the grist and full volume of liquor, but I personally keep it to small batches. This batch was 6 quarts. I mashed in with 10 quarts of water to stabilize the mash at 155 degrees and mashed for an hour, with the kettle wrapped in towels to retain heat. I still had to fire the burner a few times to keep the mash temperature high enough. If you do this, make sure to either take the bag out while the burner is on, or place a plate at the bottom of the kettle to dissipate the direct heat. Nylon mesh bags melt very easily. Every man should learn how to roll and tuck his bag to keep it safely away from open flames. Fresh figs are hard to find right now, so I bought dried figs in bulk from the local Whole Foods. I chopped 4 oz, leaving me with a sticky knife, and added them to the kettle to boil for 60 minutes to develop flavor and brown the sugars. I meant to say really sticky. Hops were not used in barley beer until the 11th century CE, so I didn’t use any. Instead, I delved into a fantastic book called The Flavor Bible for inspiration on bittering ingredients that might go well with fig. I settled on a quarter ounce of dried bitter orange peel (a traditional ingredient in Belgian witbiers, and available at most homebrew shops) and 7 sprigs of fresh thyme, and added these to the boil with 5 minutes left, along with another 1.5 oz of chopped figs. Before boiling, the gravity was a measly 1.026, which would likely have boiled down to something in the 1.030-1.040 range. That’s fine for a session beer, but not for a rustic brew worthy of an ancient Cypriot warrior. To raise the potential alcohol, I added a pound of wildflower honey at flameout. According to Patrick McGovern’s Uncorking the Past (another fantastic book), many ancient brews were “grogs” made by mixing fermentable sugars – malt, grapes, honey, other fruits – so I was still channeling my Bronze Age forebears here, though this could technically qualify as a “braggot” by modern standards. Straining out the chunky bits. When all was said and done, with sugars from malt, figs, and honey, the wort at pitching time was 1.078, a fairly big brew. I pitched a 600 mL starter made from Dogfish Head Midas Touch dregs I cultivated from a bottle. The offering, prepped and ready for sacrifice. Would the ancient brew gods reward my efforts with the dulcet tones of a gurgling airlock? Find out in my next update. UPDATE NOTE: This post describes a failed attempt at cultivating bottle dregs. If you’ve found this page looking for information on how to cultivate bottle dregs for pitching into beer wort, thank you for reading but please do not follow my process below. It didn’t work for me, as you can read in my follow-up here. After deciding to brew a Bronze Age-inspired fig beer, I quickly went to work on the recipe in the hopes of brewing it on Monday (which I have off from my day job). It’ll be a 1-gallon experiment batch, with 2-row barley and rauch malt for that Bronze Age kiln-smoked flavor. Bitter orange peel will feature as a flavoring, and I haven’t decided yet whether it’ll have minimal hops or none. 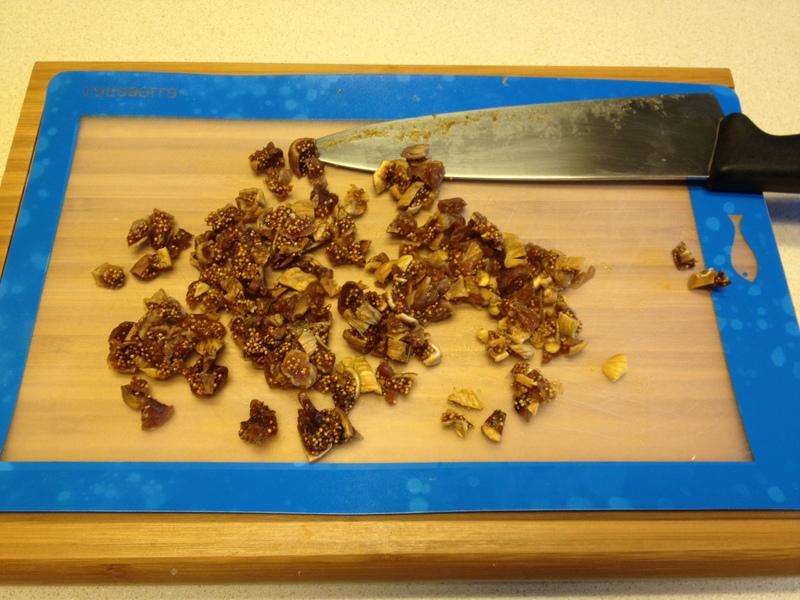 Honey and figs will round out the flavor and provide additional fermentable sugar. For yeast, I plan to cultivate a 2-step starter from the dregs in a bottle of Dogfish Head Midas Touch. I’ve never cultivated a starter from bottle dregs before. Why now, and why Midas Touch? One usually hears about brewers cultivating dregs from sour beers like Orval to harvest the unique blend of Brett and bacteria strains that make those beers special, as described in this blog entry from TheMadFermentationist.com. But it should work with clean Saccharomyces as well. I’m not sure what kind of yeast is used to ferment Midas Touch, though clone recipes online call for Trappist ale strains. I don’t even know if the yeast Dogfish Head bottles Midas Touch on is the same as the yeast that ferments it – many breweries use different yeasts for bottle conditioning. So my decision to use Midas Touch dregs was less about capturing a particular unique yeast than it was about superstition. 9 out of 10 prehistoric shamans agree: Consume your totem’s essence to gain its power. 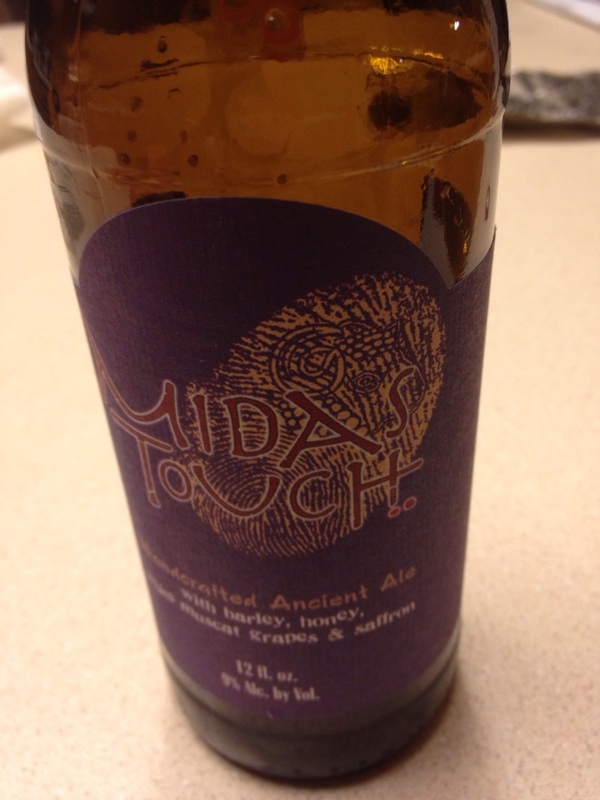 Midas Touch is one of Dogfish Head’s “ancient ales” and is based on chemical analysis of bronze vessels found in Gordion in Central Turkey – roughly the same part of the world as Cyprus, where my fig beer has its inspirational roots. I thought the dregs might be a good luck charm for my first foray into ancient brewing: a little piece of the magic from Sam Calagione and Dr. Patrick McGovern, two of the high priests of modern ancient ale reproduction. But really, the main reason I did it was because it sounded like fun and I’ve never done it before. I made a first-step starter wort of 200 milliliters to bring the bottle yeast back from the dead. When that ferments out, I’ll “step it up” to a second starter of 500 mL. 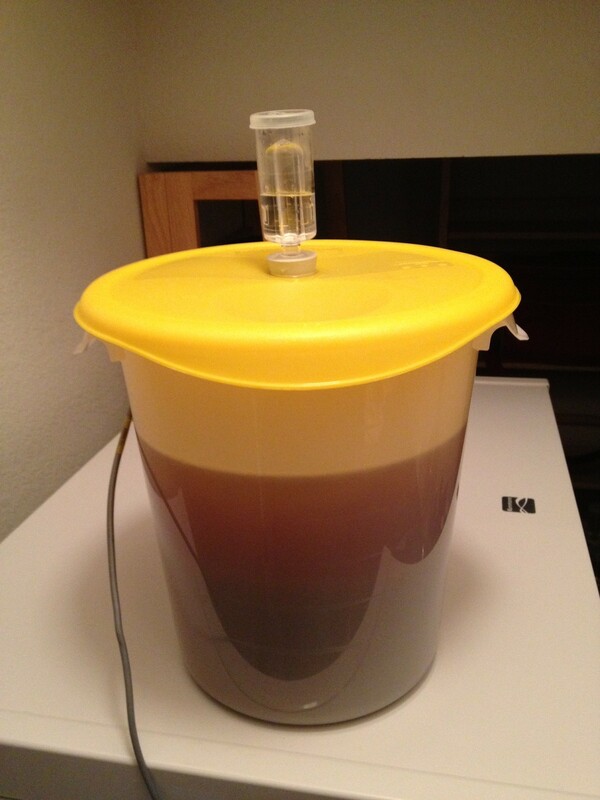 For a full 5-gallon batch I’d continue stepping up to 2 liters, but for a 1-gallon batch, 500 mL should suffice. I scaled down my usual starter process as well as I could, realizing it’s okay if some the math isn’t exact in a wild-shot experiment. 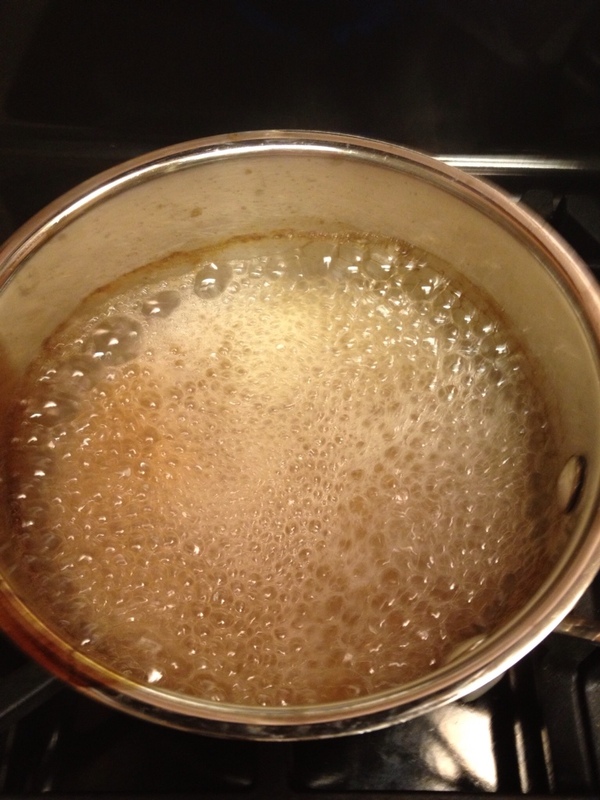 I dissolved 15 grams of extra light dry malt extract in 200 mL of boiling water. Usually I use 1 gram per 10 milliliters, but I’m hoping the lower OG starter will give a little advantage to sleepy yeast. I also added 3/32 of a teaspoon of yeast nutrient. While that sounds like a strange fraction to use, it’s simply one each of the “pinch” and “smidgen” measuring spoons (or 3 “smidgens”) available at specialty kitchen stores. Those little spoons aren’t all that useful on a day-to-day basis, but I keep them around just for tiny measurements like this. For the record, an exact scaling of my usual 1/2 teaspoon nutrient per liter of starter would have been 1/10 teaspoon. It was almost too small to boil on the stovetop. 5 minutes of boiling reduced the starter volume more than expected, so after I cooled it and transferred to a sanitized pint glass, I topped off with pre-boiled water and chilled in the freezer to an acceptable pitching temperature of 84°F. 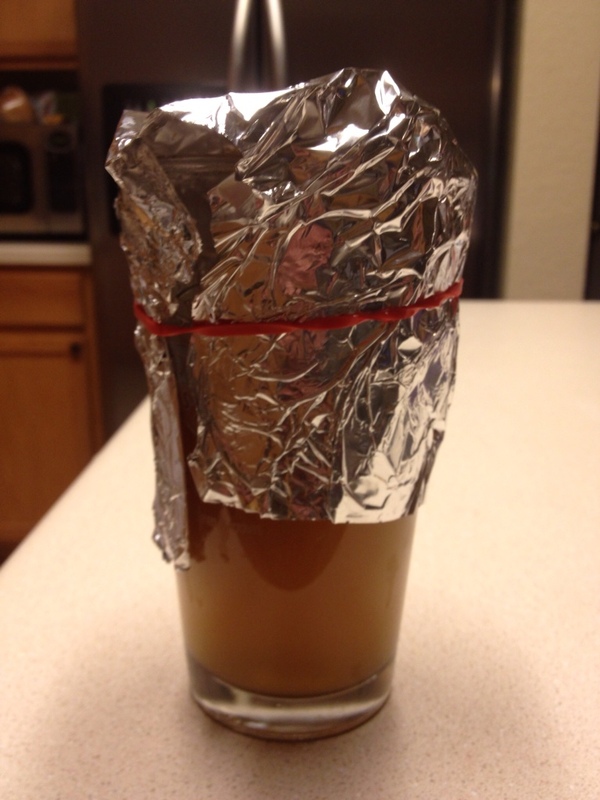 I roused the yeast in the last half-inch of a bottle of Midas Touch (which I had already poured into a glass and was drinking) and pitched it. Ready for the stir plate. As of today, there’s no visible sign of fermentation in the starter, but there is a pleasant boozy smell coming from the glass. There’s no telling how few viable yeast cells were in that bottle, but even a few cells should reproduce given time. We’ll see how it shakes out by Monday. I never do anything too crazy without a safety net, so I have a packet of Fermentis Safbrew T-58 – a spicy Belgian yeast strain with reported clove notes, which should go well with honey, fig and smoke – on hand just in case I don’t get a usable starter. But that’s Plan B.
Here’s hoping the Bronze Age beer gods smile on my undertaking. In the latest podcast episode of Basic Brewing Radio (“Bronze Age Brewing”, aired January 3, 2013) host James Spencer interviewed Ian Hill of the Heritage and Archaeological Research Practice based in the UK, about an ancient “microbrewery” structure discovered by University of Manchester archaeologists at the Bronze Age settlement of Kissonerga-Skalia, near the modern city of Paphos in Cyprus. A link to the story on the Telegraph’s website is below. The conclusion that the structure was a malthouse/brewery came mostly through process of elimination, as Hill explains in the podcast. Some barley was found nearby along with fig seeds, which suggests a barley-based beer, perhaps with some smoked malt flavor as an accidental result of the kiln being contained in such a small space – a theory supported by smoky residue on the walls of the structure. The figs may have been a flavor additive, or may have been added to the wort to start fermentation via the introduction of wild yeast living on the figs’ skin. Hill went on to explain how in August of 2012, he and some others on his team reconstructed the structure offsite to try malting some grain using the Kissonerga-Skalia setup, then brewed some beer with the grain they malted. They made several batches with different parameters. Mash thicknesses varied, but the thinnest was 7 liters per kilogram of grain, which works out to 3.36 qts/lb, a thin mash but well within the range of no-sparge “Brew in a Bag” techniques. They doughed in at 70°C (158°F) and kept the mash temperature above 65°C (149°F): pretty typical mash. Although the Bronze Age beer probably was not boiled, Hill’s team boiled theirs to sanitize it. They did not add any hops. They pitched one batch with crushed figs to emulate the wild fermentation technique speculated for the ancient beer. A second batch was pitched with grapes (also a source of wild yeast) instead of figs. 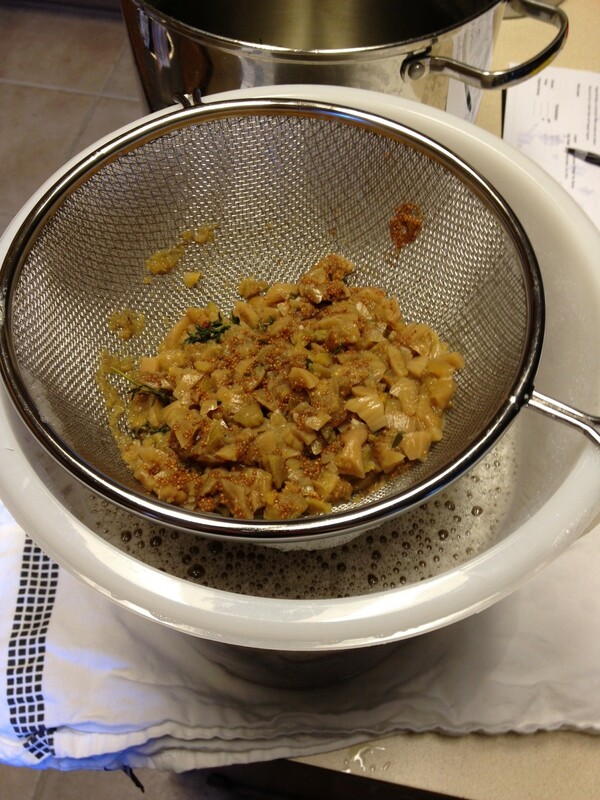 A third batch was fruit-free and pitched with brewer’s yeast as a control. I won’t spoil the results – the podcast is short and fun, and completely worth listening to. Idea time. I’d like to take the plunge into making an “ancient” beer of my own. I’m a history lover – the older the better – and like the idea of getting in touch with my ancient brewer ancestors by trying out their ingredients and techniques. Patrick McGovern’s book Uncorking the Past: The Quest for Wine, Beer, and Other Alcoholic Beverages is an inspiring read, and I love the work he’s done with Dogfish Head on beers like Midas Touch and Chateau Jiahu. But until now I haven’t had the motivation to get off the fence and dive in with an ancient recipe of my own. Until now. The figs are speaking to something deep in my soul. Maybe it’s because at Christmas, someone in the family raided the canister of my aunt’s famous Italian fig cookies before I could, and I’ve been craving them ever since. And my recent introduction to historical brewing – Colonial Progress Ale – ended up tasting pretty damn good and has gotten great reviews from friends. I’m feeling ambitious. So I’m going to brew a Kissonerga-Skalia beer with some smoked malt. I don’t think I’ve got the figs to do an all-wild fermentation, but I would like to try cultivating dregs from a bottle of Midas Touch. And I will use some fig somewhere in the brew for flavor and additional sugar. It sounds like a good spring beer, so that gives me between now and early February to put together a recipe. In the meantime, I’ll remember a quote from Ian Hill in the podcast that stuck with me: “Archaeologists love their beer, so it’s not a bad thing to find.” Indeed. With highland-like winter winds dropping the temperature outside to near freezing and the tune of “Auld Lang Syne” still in my head, it’s no surprise that my thoughts turned to Scotland for my first cellar beer of 2013. My attention was captured by a couple of bottles from BrewDog that I’ve been cellaring for the better part of a year. I consider myself a BrewDog fan. Based in northern Scotland, they’ve earned a reputation for extreme beers. Three of their beers – Tactical Nuclear Penguin, Sink the Bismarck!, and The End of History – were freeze distilled to achieve ABVs of 32%, 41%, and 55% making each the “strongest beer ever made” at the time it was released. I stopped into their brewpub in Edinburgh twice while visiting the UK in 2011 and tried both Tactical Nuclear Penguin and Sink the Bismarck!. Served at a premium price in tiny pours (I believe they were 50 mL, not quite 2 ounces) and made for sipping, they weren’t drinks I would ever reach for when I wanted a “beer”, but they were enjoyable, unique and worthy of the recognition they received worldwide. But BrewDog’s history of record-chasing hasn’t brought them unanimous appreciation at home. They’ve courted controversy, been targeted by industry watchdogs, and feuded with London-based international beverage giant Diageo. A couple of UK natives I’ve spoken to have even told me they didn’t appreciate BrewDog bringing American-style brewing excess to the British Isles, though their growth and success suggest that’s a minority opinion. In any case, from here in the USA – where excess in brewing often manifests itself through the same old tricks: higher gravity, more hops, stranger microbes, etc. – BrewDog’s innovative excess looks very original to me, and I’m glad they’re in business. A 12-ounce bottle of BrewDog Paradox Isle of Arran Imperial Stout, barrel aged in scotch whisky barrels and 10% ABV, sounded perfect to stave off the cold. I put it in the fridge for a few hours to chill slightly and served it up. The beer poured almost black, with chocolatey brown hues showing when the light hit the pouring beer just right. It didn’t pour nearly as thick or syrupy as I expected it to, suggesting a thinner body than many other imperial stouts. Once in the glass, it was tar black with no head. The aroma was strong with scotch whisky at first, and burned my nose a little. As I continued to sniff, it faded to a barleywine-like booziness with raisin and black cherry notes along with blackstrap molasses and mouthwatering caramel. Strangely, the flavor was very mellow – a bit too much so. I tasted more raisin than anything, with a little oaky whisky flavor underneath but very little indicative of an imperial stout; it tasted more like a very dark English old ale. As the beer warmed to room temperature, a little bit of roasty stout character emerged, but not enough to balance the whisky notes. And as the pour suggested, the beer was very thin, with very little residual sugar to hold up the whisky and raisin notes. I suspect that I aged this beer too long, which is a shame. It didn’t taste stale, but was unbalanced, as though some flavor notes faded faster than others. For a brewery known for extreme beers, this one came across as soft in the wrong ways. But I won’t fault BrewDog for that. I’d love to buy another bottle and try it again someday, but it seems the Paradox line has moved on to other things. Whatever is next, I’ll be watching.